Heat oven to 350°F. Spray 8-inch square (2-quart) glass baking dish with cooking spray. In medium bowl, mix chicken and sauce. In 12-inch skillet, heat oil over medium heat. Add onion, celery and carrot; cook 6 to 7 minutes or until carrot is tender. Stir in chicken mixture and broth. Add cream cheese cubes and 1 1/4 cups of the Cheddar cheese; stir until completely melted. Pour mixture into baking dish. Meanwhile, in small bowl, mix Bisquick™ mix, milk, green onions and remaining 1/4 cup Cheddar cheese until well blended. Spoon 16 tablespoons dough on top of chicken mixture. 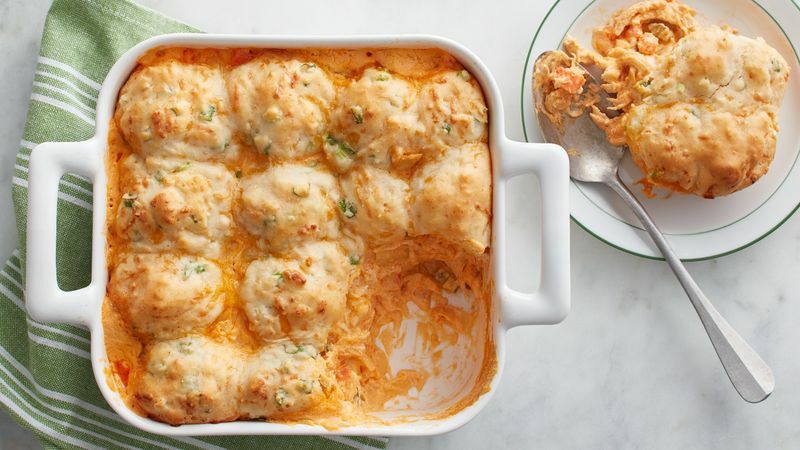 Bake uncovered 20 to 25 minutes or until casserole is bubbly and biscuits are golden brown. Want to spice it up? Serve with additional sauce on the side. After baking, tops of the biscuits can be brushed with melted butter for extra flavor.